Before anything can be said about the rhetorics or ideas behind the Besides, History: Go Hasegawa, Kersten Geers, David Van Severen show at the Canadian Centre for Architecture (CCA), it must be noted that it is exceptionally beautiful. 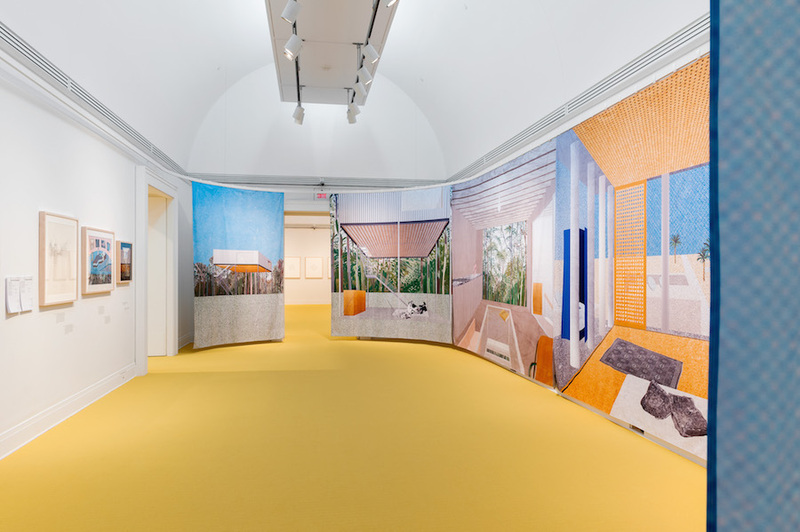 The entirety of the generous seven-gallery space is filled with a striking goldenrod-yellow carpet, contrasted with the mostly white work. Symmetrically laid out, each room is filled with models, installations, and/or drawings, all finely crafted specifically for the show. On these merits alone, it is a delight to walk through; and yet, as an exhibition, the concepts and projects presented also contain layered, if sometimes unsubtle, architectural conversations. Besides, History is the fifth in a series of exhibitions produced by the CCA. In each iteration, two practices, often with disparately separate projects, are paired to work together with the CCA’s curators to produce a show. In the case of Besides, History, Tokyo-based Go Hasegawa was matched with Kersten Geers and David Van Severen of Brussels-based OFFICE. A third voice was also added to the mix in the form of the CCA’s extensive architectural archive of drawings, collages, and photographs: The CCA’s Chief Curator, Giovanna Borasi, curated the work of Hasegawa and OFFICE, while Italian photographer Stefano Graziani curated a photographic gallery entitled Through Your Eyes, which acts as an introduction to the larger exhibition. Considering this wide range of strong voices, Besides, History has a surprisingly clear vision. Works by the Hasegawa and OFFICE are presented alongside each other and selections from the archive. In each gallery a strategic flattening of representational techniques provides a chance to compare the pieces, apples to apples. For example, in one space six projects from each practice were built as 1:100 pure-white models by Hasegawa’s office, while in another room giant curtains are printed with works by both practices in OFFICE’s distinct collaged perspective. Through this method, similarities and differences between the practices become apparent. This same technique is deployed when each firm engages with the historical pieces drawn from the archive. One gallery presents immense 1:5-scale drawings of sections from both offices. In another, simple framed plan drawings march around the room. Both plan and section galleries are punctuated by historic pieces from the archive, with representative works from the likes of Gunnar Asplund, Aldo Rossi, Andrea Palladio, and Kazunari Sakamoto. Particularly in the plan room, the contemporary works of OFFICE and Hasegawa are presented in nearly exactly the same manner as the historic works. But while this provides a fascinating look into the congruencies and divergences of architecture over time, some may find this aspect of the show problematic. As more and more architects and academics refocus on the role of architectural history in contemporary practice, there is no sign of consensus on if, or how, it should be used. Unlike postmodernists, today’s practitioners are only loosely referencing history as it fits the needs of their projects. This in itself may not be an issue for many people, but the way in which the works of masters are used in Besides, History is something different. For most, only when the works of OFFICE and Hasegawa are placed immediately next to historic pieces will the connection between them become clear. And even so, that connection could be read less as one of reference and more of curated correlation. Presenting one’s own work in exactly the same way as one presents iconic pieces, side by side, could definitely be interpreted as hubris. But, to be fair, it seems that this was not an intention behind the show. Rather, it would appear that the selection of historical works is driven more by admiration than by appropriation. What architect wouldn’t love to be set loose on the immense archives of the CCA to pick and choose their favorite works to display along with their own? To this point, Besides, History, as Borasi describes it, is a manifesto. Together Hasegawa and OFFICE are presenting the state of their practices with historical footnotes, which happen to be original drawings by many of the greats. This is made most clear in the final two rooms, which are dedicated to full-scale installations of completed works by both offices. In one space, Hasegawa’s house in Kyoto is rendered in a flat gray material, while in another a portion of OFFICE’s Villa Schor takes the same neutral tone. Once again, this provides an instance to appreciate the similarities and differences between the practices. With only drawings and photographs of the built structures, these rooms offer a needed moment away from historical pieces for visitors to decide for themselves what lines of history either cross or guide the work. The word “besides” holds the unusual distinction of having two related, but decidedly different, uses. As a preposition, it is used to denote something apart from, or in addition to, something else. As an adverb, it modifies verbs and adjectives to make something a part of something else. At least in the case of this show, Besides, History may be the best way to describe the work of Go Hasegawa, Kersten Geers, and David Van Severen. Besides, History is on view through October 15 at the Canadian Centre for Architecture, 1920 Baile Street, Montreal.